"The specified security organization undertook obligations on fire prevention measures in the facility and even in the fifty-meter zone around it under contract for providing private security services. I want to highlight that private security organizations are established only for providing security services. Fire prevention measures are not services provided by security organizations," Ternova stressed. Head of the Main Directorate for State Control and Licensing of the Federal National Guard Troops Service Leonid Vedenov said that "By all parameters the Zimnyaya Vishnya shopping mall fell under the provisions of the law ‘On Countering Terrorism’: it had an anti-terrorism security certificate and, under the security requirements for such facilities, the security contractor had to fulfil certain requirements. <...> It lacked a specific activity that had to be named in the license, and this type of activity in itself should be carried out only if there are weapons. The specified security organization had neither the corresponding type of activity in the license, nor the right to carry weapons." 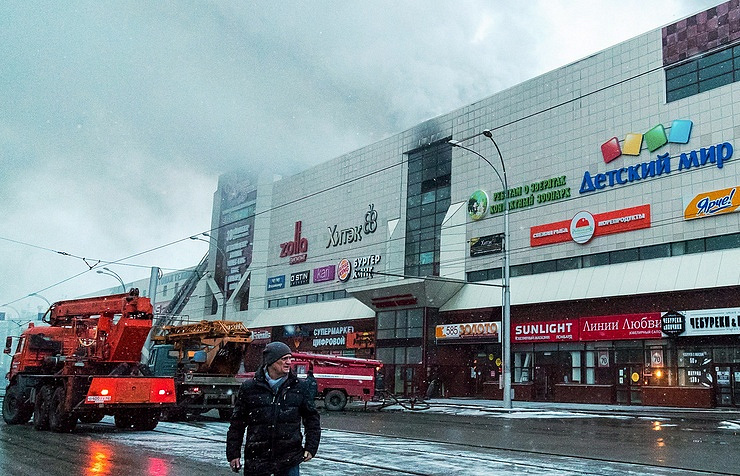 A fire broke out in the Zimnyaya Vishnya (Winter Cherry) shopping mall in the Siberian city of Kemerovo, claiming the lives of 64 people, including 41 children, and injuring 79 people, with 27 children among them. According to earlier reports, several versions are being investigated, including short-circuit failure and arson. Seven people were arrested as defendants in the criminal case.